There were several situations in week seven that didn’t pan out for fantasy owners. Let’s see how that looked for your favorite rookies in the Week 7 Rookie Review! Hunt continues to dominate. He now has seven straight games with over 100 yards from scrimmage. His floor has been incredible thus far. Speaking of dominating, Jones completely took over the Green Bay backfield in week seven. He out-snapped Ty Montgomery 44 to 7, and TyMo’s touches only translated to fifteen yards on five touches. It’ll be interesting to see if this split carries over after their bye week. This is what fantasy owners dreamed of whenever Kamara was drafted in the third round by the Saints. Ingram will continue to shoulder the load in the run game, but the UT product ranks second in targets in New Orleans. Even with a mere 46 scrimmage yards, CMC still gave owners 11 points in full PPR. He was first on the team in targets, catching seven of nine balls. It was another underwhelming game in terms of rushing, but his receiving floor will keep owners afloat. A few weeks ago, it appeared that Branden Oliver was the clear backup to Melvin Gordon. After practicing in full, and looking like he would return from a hamstring injury, Oliver was inactive. Obviously neither is more than a handcuff, but if Gordon were to miss time, Ekeler might receive the majority of snaps. Gio Bernard paced Mixon by one snap in Sunday’s game versus the Steelers, but Mixon was still the best looking back for the Bengals. Gio and Hill had eight combined touches for an amazing 14 yards. It’s clear why the Bengals are giving the two veterans touches. Yes, those last two sentences should be read sarcastically. Sooner or later, the buying window for Mixon will slam shut. This game represented the first time all season that Mack out snapped Pap Pap Gore, 32 to 22. The Colts trailing 20-0 at halftime was probably a key factor, but worth noting regardless. Keep an eye on this going forward as Indy now sits at 2-5. The New York Giants backfield is a situation to completely avoid. They could be a team in line for the Saquon Sweepstakes, or they could continue with their committee approach. I’ll just shrug my shoulders and move on. After Breida out-snapped Carlos Hyde in week five, and Coach Shanahan said there isn’t much of a difference between the two backs, Breida has 32 snaps to Hyde’s 107. Breida is turning into a handcuff-only option. If you have Le’Veon and you don’t have Conner, you need to change that. Bell currently leads all running backs in the NFL with 202 touches, including 38 and 35 the past two weeks. You can’t start McGuire unless Forte or Powell are inactive. Clement saw half as many snaps as Smallwood and Blount. He’s on the same level as McGuire. The situation looks worse each week, somehow. Taylor was third on the 49ers in receiving yards behind Goodwin and Garcon. We would think that a slot WR that runs good routes would be a rookie quarterback’s best friend. We’ll see how Beathard progresses next week. Jared Goff looked Kupp’s way for a team-high 10 targets. Kupp could have had a bigger day had he come down with a handful of catches, one being an end zone drop. I’d feel comfortable rolling him out just about every week as a safe floor play. With fellow rookie Corey Davis hopefully returning in week nine, I’m expecting Taywan’s playing time to drop significantly. If you have the roster space, Taylor is definitely worth holding. Rudolph saw six targets against Seattle, good for second on the team. Impressively, his 32 yards were also second. With Sterling Shepard slated to come back after their bye week, I’m not sure what role Rudolph will have going forward. 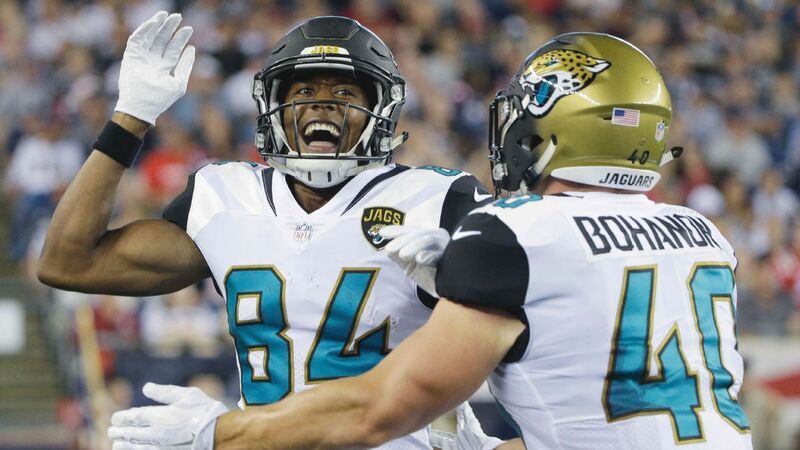 As I’ve stated before, he’s the Jaguars’ third receiver getting thrown to by Blake Bortles. There’s nothing enticing here unless Hurns or Lee go down with injury. Even then, he’d still be a dart-throw, hope-and-pray flex play. While JuJu has only seen more than five targets twice this year, he’s making the most of his opportunities. The Steelers’ schedule going forward is favorable for receivers, so we may see an increase in targets for the rookie out of USC. With no offensive line, and therefore no run game to speak of, the Seahawks are finally letting Russell Wilson throw the ball. Darboh is definitely further down the pecking order, but with the increased passing attempts Darboh could be a name to stash. This entry pains me every week. He had the perfect set-up and has squandered it. After catching just two of nine targets against the Bucs, Zay currently has caught 7 of 32 targets on the year. Yikes. FOR THE LOVE OF GOD, STASH HIM BEFORE IT’S TOO LATE! Alshon is on a one year deal, and Torrey Smith can be cut next year with no cap hit. There’s potential for him to be the number two receiver with a rising star QB. It’s difficult to see Samuel’s upside for this year. Carolina’s offense is more off and on than some of my previous relationships [Editor’s Note: Article coming soon?]. The one target that Gentry saw equated to a 14% target share. That’s gross. The Bears have now traded for Dontrelle Inman, leaving Gentry’s role up in the air. Either way, he’s not somebody I’d look twice at on waivers. Hold on your taxi squads and hope that he can surpass Humphries next year. This game was easily the best of Howard’s early career, setting highs in targets, catches, yards, and touchdowns. This game also marked two straight weeks that Howard saw more snaps than Cameron Brate. However, here’s a little warning: don’t chase these points. Both of his TDs came on wide-open looks. If you’re looking to buy him, now isn’t the time. If you already have him, I’d be wary of plugging him in as a starter. Engram saw 12 targets, doubling both Travis Rudolph and Roger Lewis. Fire him up each week with confidence. Whenever your offense is struggling, the answer is to limit an explosive playmaker’s snaps. I guess? What a frustrating situation. Along with Mack Hollins, Jonnu is another favorite stash of mine. I see him eventually taking over for Delanie and not skipping a beat. Last week I took a lovely stroll down Narrative Street. I returned bloodied and bruised. The Iowa connection between Kittle and Beathard was set up perfectly, and couldn’t have gone much worse. Kittle saw just two targets and split time with Garrett Celek and UDFA Cole Hikutini. Makes sense. He’s on here because he caught a pass. That’s it. I’m bitter from being wrong on the Iowa connection, so I have nothing nice to say about Hikutini. Leave him at the bottom of your waivers. That’s it for the Week 7 Rookie Review. Hopefully week eight won’t be as tilting, but with the way this year is going, I’m not counting on it. Don’t forget to check out Football Outsiders for their exclusive stats, and Pro Football Reference for their incredible database!